There is an overwhelming amount of error in today’s lesson and in order to cover it quickly I ask that you have your lesson in front of you as I will not be providing an overview of the days lesson. Scripture is clear that human’s who belong to God are called “saints”. Simply read the Psalms, or do a word search on GatewayBible.com. The fact that Jesus returns with His saints provides scriptural evidence that upon death the saints go to be with the Lord and when He returns He brings them with Him. This is why when we read the words of Psalm 116:15, “Precious in the sight of the LORD is the death of his saints,” we can know that our God is a God who looks with longing to our homecoming, and is not a God who takes joy in our suffering or loss of life. The text speaking of saints as dying is further evidence that saints are humans, for humans are the only created beings who die. The next thing I would like to point out is Jon Paulien’s continual use of the word “wicked” when describing those who will suffer judgement. This is simply not in the text. The Bible says that those who will suffer judgement are unbelievers and those who do not obey the gospel of Jesus Christ. This category of people does not necessarily look “wicked” to mankind. The author is clearly bent on describing the lost as “evil” or “wicked” and the saved as “good”. The natural result of this, is that to be saved we must be good. This teaching sheds light on the author’s agenda to create a works-driven theology that pushes its adherents into law-keeping and ignores the work of God in us through faith in the completed atonement of Jesus Christ (see the commentary for July 7 for more on this.). This worldview is why the author uses 2 Thess. 1:11 to admonish Adventists to do good works to prepare for the second coming rather than to expose the text as the beautiful truth of God’s indwelling work for the glory of His name! It is true that unbelievers are evil, it is also true that the only thing “good” about the saved is the righteousness of Jesus that is theirs on the basis of belief and not good works (Eph. 2:9). Jesus Himself calls his disciples evil (Matt 7:11, Luke 11:13). Mankind is evil no matter how many laws or rules we follow. 2 Thessalonians 1:11 is clear that any good work of faith is done by God Himself using us for His glory. This good does not come from us, but from Him! This resolve to do good is His resolve in us! This is why we must be born again, so that we are in Him and He in us and we are counted as righteous and then we are able to be used for His glory. Jon Paulien’s misuse of scripture is, in my opinion, quite abusive. Not only does he abuse the word of God by altering it’s meaning, naturally resulting in the defaming of God’s character and gospel, but he is also spiritually abusing those who blindly trust his teaching. 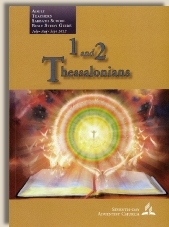 Another example of the author speaking Adventist doctrine into the the text rather than letting the text say what it says, is when he talks about, “the full glorification of Jesus in the eyes of all.” In fact, the text here says that He will be marveled at by those who believed not by “all”. While this may seem like an insignificant change, it is actually quite significant and you can see why if you do a study of Adventist teachings on the second coming verses, for example, the progressive dispensational teachings of scripture. The Adventist alterations of scripture are rarely accidental. Jon Paulien also states in the lesson that the earth will lie desolate during the millennium and uses Revelation 20 as scriptural evidence. He states that it is not clear what will happen to believers, but the passage is quite clear about what happens during the millennium. Satan is bound so that he cannot deceive the nations of the earth. Clearly there are nations and people here during that time! At the end of the millennium he is let loose and the passage explains that he and the nations will march “over the broad plain of the earth” (Rev. 20:9) and surround “the camp of the saints” where they are reining as priests with Christ during the millennium (Rev. 20:5). This clearly indicates that believers and unbelievers alike will be here on the earth (quite a significant difference from Adventist teachings)! The earth is populated during and at the end of the millennium. To say otherwise to ignore the word of God. All that being said, the most disturbing of all of the distortions of scripture found in today’s lesson are by far His statements about God at the end of the lesson. The author writes, “According to inspiration, Jesus is God. This teaching is very important to us...” (A side note here, I recommend you take a quick look at the author’s choice of EGW quotes for Friday. This will help you understand that the Adventist way is to elevate the professed “inspiration of man” and to depress the authority of the inerrant and infallible scriptures!) Jesus being God is a fact not merely a teaching! We are saved on the basis of belief in the fact that Jesus Christ is God the Son who came as the propitiation for mankind! This is God’s testimony about His Son, and when we believe that testimony we have God in us and the full assurance of our salvation (1 John 5:6-13)! As a friend stated, Adventists would never say that 2+2=4 is a “teaching”, they would say it is a fact. To say that “Jesus is God” is a teaching, rather than the most important truth in the world, opens the door wide to accepting other “teachings” as long as Adventists remain loyal to the Law (the Sabbath), do good works, and are not “wicked” by human standards. The fact that Adventist doctrine, teachers, and prophetess do not regard the Bible as the only inerrant and authoritative source of truth, and the fact that they misrepresent that nature of the word of God (see tomorrow’s lesson), yet claim to be the “only religion that is sola scriptura”, is more evidence of the abusive and crazy making double statements of an unorthodox cultic religious system that has an answer for every accusation because they simply provide whatever statement of theirs will appease inquiring minds. The Adventist push to uphold God’s law so that they can vindicate His character to the watching world, do good, and be ready at all times for the end reminds me an awful lot of the loyalty of countrymen under the rule of a dictator. Their obedience is not out of true love for their leader, but out of loyalty and obligation to vindicate his character and uphold his reputation, do his bidding, and be prepared at all times to do his will so that they do not incur his wrath. So they stand at their parade, waving their flags, smiling as he passes by, and wiping their brow in relief when he is not around so that they can breath and feel a sense of short lived freedom until he passes by again. They do not feel love for him or loved by him. Their obedience is their evidence of “love/loyalty” for him. It is not a condition of the heart. Copyright 2012 BibleStudiesForAdventists.com. All rights reserved. Revised September 11, 2012. This website is published by Life Assurance Ministries, Camp Verde, Arizona, USA, the publisher of Proclamation! Magazine. Contact email: BibleStudiesForAdventists@gmail.com.